Family friendly at West Drip Farm self catering accommodation near Stirling Scotland. David Marshall Lodge – near Aberfoyle – closed cicuit TV is used to observe Ospreys at their nest during breeding season. Fantastic marked walks and mountain biking terrain, cafe, childrens playground, visitors centre and the location of “GO APE!” high wire adventure course. For a 15% discount on Go Ape, quote TROSSACHS at time of booking. 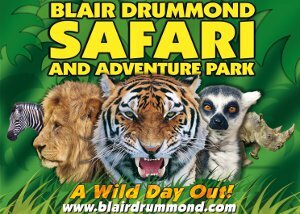 Blairdrummond Safari Park – Just a few minutes along the road from Tigh Mor is Blairdrummond Safari and Adventure Park. Visit the wild life animal reserves, adventure playground, boat trip around chimp island, pets farm, lemur land and much more. Open from mid March to October. Briarlands Farm Just along the road from Tigh Mor, Briarlands Farm is ideal for young families. Attractions include jumping pillows, tractor go arts, cable ride, outdoor play structures, mini diggers, tyre maze, sand pits, animal paddock, cafe, shop and indoor area. Closed January. Auchingarrich – For a family day out visit Auchingarrich for wild animals, wild bird hatchery, woodland walks, falonry, fishery, adventure playground, picnic sites, walks and a great coffee shop too! Edinburgh Zoo – see the pandas and a whole lot more! Five Sisters Zoo – highly recommended by recent guests at Tigh Mor.